Amalfi is one of the most beautiful cities in Campania (the yellow region on the map), a wonderful Southern Italian region offering many touristic attractions. Amalfi is located about 50Km south of Naples and 25Km north of Salerno. Amalfi is a quiet and picturesque seaside resort with a temperate climate and incomparable natural beauties. It has some of the oldest hotels in Italy as well as many modern ones. You can reach Amalfi by car or by bus from Salerno or Naples. Closest International Airports are Rome Fiumicino and Naples Capodichino. There is also a small airport in Salerno, but only few flights operate on it. Alibus service provides direct connections from Naples Capodichino Airport to the railway station at Piazza Garibaldi. The ticket costs 3,00 Euro and are sold by the driver. To check the timetable click here. You can also reach Naples by train from Rome. Direct buses connect Naples Capodichino Airport to Salerno. From Monday to Saturday the service is provided by SITA (see here for timetable and fares). On Sunday it is provided by Co.Sa.T. : the bus leaves at 08.45, 12.15, 16.15 and 19.45. Ticket is available on board and it costs 7,00 Euro. You can also reserve your seat by sending an email. From Naples railway station you can reach Salerno by train or you can take a bus from the SITA bus stop in Via Galileo Ferraris (walking directions available here). The bus ticket is UNICO Campania ticket Fascia 5: you can buy it in the newspapers booth in the railway station. Notice that the ticket cannot be purchased on board and it is valid only if clipped on the yellow machine on the bus. From Rome there are direct trains to Salerno. Information about connections from Salerno airport to Salerno railway station are available here. Coming from Roma or Naples, the easiest way is to take the exit "Vietri sul Mare" on the highway A3 from Naples to Salerno and then take the route "163 Amalfitana" by following the yellow signs "Costiera Amalfitana". Amalfi is about 18km far from the "Vietri sul Mare" exit. Coming from Salerno, follow indications to "Vietri sul Mare" or "Amalfi". There is a bus service from Naples to Amalfi provided by SITA. The bus takes 2 hours and costs 4.00 Euro. For this line you need a UNICO Campania ticket Fascia 5. You can buy tickets in the newspapers booth (see in the railway station, for example). Notice that the ticket cannot be purchased on board and it is valid only if clipped on the yellow machine on the bus. The bus runs only on working days and leaves at 9.00, 14.15, 17.30. 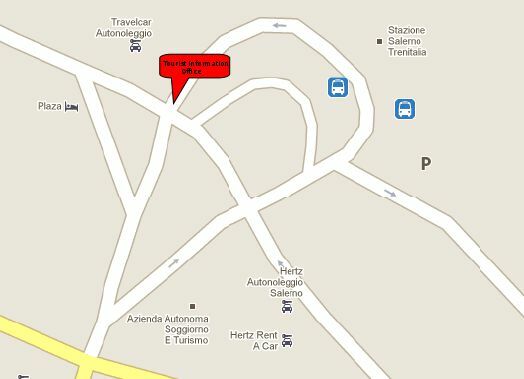 The most convenient bus stop is near the railway station in Via Galileo Ferraris (walking directions available here). There is a bus service from Salerno to Amalfi provided by SITA. The newspaper shop inside the railways station. The following is a list of hotels that offer special price to partecipants at SAGT 2011. All the hotels are walking distance from the conference venue. To obtain the special rate please sent an email to the hotel, mentioning "Convegno SAGT". There are other hotels in Amalfi. The following list is intended only as reference to help you in choosing your accomodation. There are no special deals between these hotels and SAGT. Amalfi is a very popular place for vacation, so reserve your hotel as soon as possible.